We often struggle with how to feel included. We may acknowledge that our response is a little irrational but we feel the tension. We may know that people are not intentionally mean but we feel excluded. We may recognize that we are overreacting but we can’t seem to control the sensations. So we either avoid the situation or force ourselves to power through and keep our emotions tucked away. Regardless of our coping technique, it can be difficult to fully enjoy life when these feelings prevail. I participate in a practice group (yes we all can use practice) with a friend and colleague, Kathleen. She expressed that she never really felt included with her sisters. She was feeling triggered because she always felt left out. She didn’t feel jealous but more like not being welcome in her own family. I asked her to recall a time she felt that way. She recalled having a nice visit with her elderly mother and anticipated being invited to her older sister’s house (as her younger sister and niece were visiting and she hadn’t seen them for ten years). No invitation came and on the long drive back to the city where she lived (early evening), she received a message : “we’re going to have (birthday) cake. Too bad you can’t make it.”. Kathleen reacted with hurt and frustration and what she was feeling was not affirmed. We applied the sentences to the trigger of the words. I then asked her to notice what was happening. She felt a little weepy with a pressure around her throat. There was an image of herself as a child around 8 or 9 years of age. She was looking out of her bedroom window, watching her siblings at play in the yard. She was longing to be there but she was excluding herself. We applies the sentences to this image of ‘me looking out of my bedroom window’. Again I asked her to notice what happened. Now there was an image of herself spitting at her younger sister while dumping milk at the swill house. So we labelled this trigger and applied the sentences. I noticed a smile appear and she now was back to the image of her sisters having cake without her. She laughed and said ‘ok – have a nice time!’. The rejected feeling had disappeared. Kathleen was able to gain a broader perspective that there were ways in which she also excludes herself socially from others in her life. The feeling of being excluded did not completely dissolve but the trigger was more manageable and she was no longer reactive to such situations. You can release your triggers to feel included. The story described above is consistent with the application of the Logosynthesis® method of guided change. Our past experiences freeze specific images, sounds and other sensory perceptions which are unique to each of us. We may each have similar feelings of being excluded but the images and sounds frozen in our space are unique. The sentences are applied to the sensory perceptions that you label as your trigger. So the conversation changes. Rather than spending time explaining how we cope when we feel this way, we can begin to identify, isolate and neutralize that triggers that cause these reactions. The result, we no longer get stuck in these habitual patterns and can create space for new and exciting challenges. We can feel as though we are included … or perhaps as in the case with Kathleen, we feel that it’s ok not to be included! 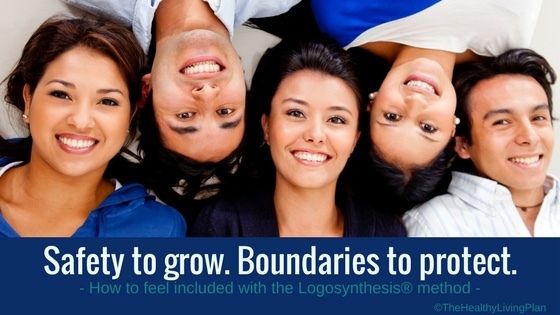 Therapists, counsellors and coaches work with clients using the Logosynthesis® method to heal trauma and build competencies. The method can also be taught for self-coaching. To learn more, contact us or contact a certified Logosynthesis practitioner to support your work.